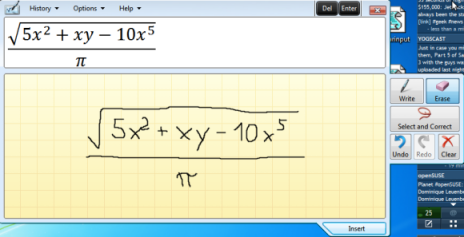 Windows 7 brings a handy tool when it comes to creating and inserting mathematical equations into text documents named Math Input Panel. You can access it by entering the name into the Windows 7 search bar. Open a document and click the Insert button to paste the equation. MIP apparently only works with Microsoft Office, since it did not work with OpenOffice as well as LibreOffice in my test.